Okay, it's our honeymoon. And that's not Niagara, it's Bowknot Bend's isthmus on the Green River in Utah. Alas, I have no pictures from the wedding, or the days immediately following. The Main Event was October 7, shortly after noon at Alum Rock Park in San Jose. Ak actually was radiant. 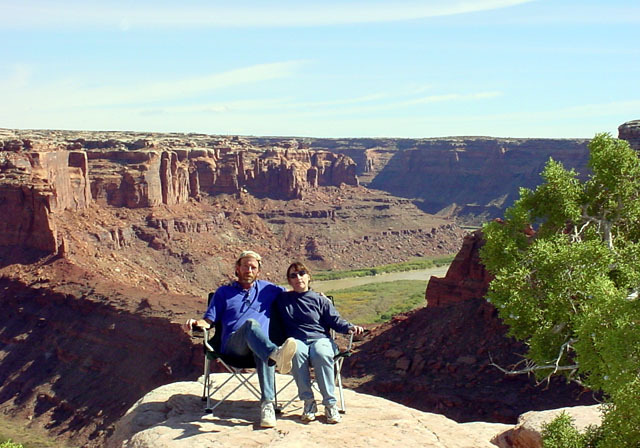 We'll have to start with a bunch of text, save for the picture above, which was taken at Bowknot Bend in Canyonlands National Park, Utah. The chair was a wedding present from Mark and Brandy Taylor. You can skip the opening narrative if you want -- it's just diary stuff. It will get more interesting later, I promise.